You guys. . you might not be ready for this, but it’s that time of the year. Parents everywhere are celebrating. . while the kids, not so much. I feel like August is such an interesting month because, I don’t about you, but we try to cram in every last thing before school starts. And at least we have the entire month of August to practice going to bed early again .. HA! We start school in early September. Who has already started school or starts school at the end of August? You know it’s that time of the year when you start to see all of the first day of school photos in your Facebook feed. Ah, how times have changed! One thing my kids are excited about is back to school shopping. . the clothes. Yes, these are my girls after all. The shoes, the skirts, the tops, the dresses. . I would save so much money if I had boys. . I think? Anyway, along with the clothes, it’s the school supplies. . and you can’t forget about the lunch bags or backpacks! My oldest is 8 now so those princess and Hello Kitty lunch containers don’t do it for her anymore. And my youngest just follows along, so even though she probably still wants to carry that Disney princess lunch bag, she won’t because she wants to be just like her big sister. 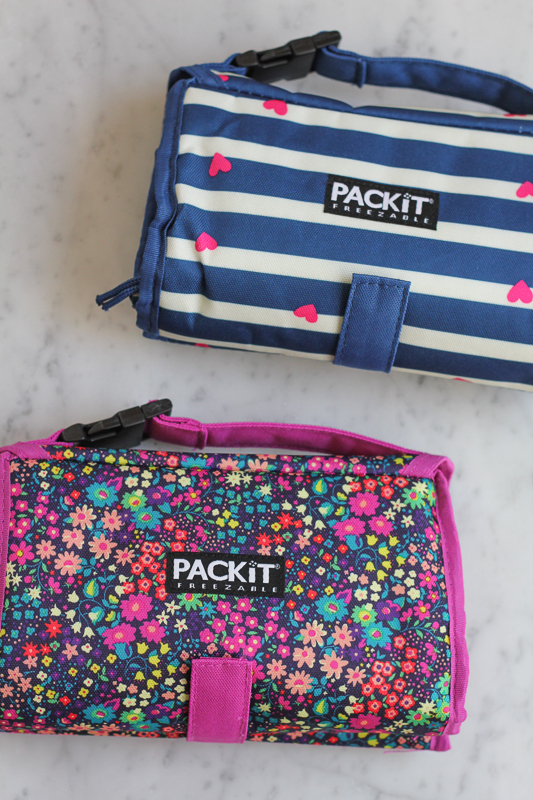 Enter these fabulous new, freezable lunch bags from PackIt! And yes, I said freezable. Now, why is that important? Well, for one, my kids love their drinks cold, like really cold and no matter what I do, the drinks never stay cold by the time they eat lunch and depending on what’s in the lunch bag, like Phoebe’s favorite pasta salad or carrot sticks or an apple, it has to be cold, like cool and not room temperature. I love the fact that the fruits and veggies that I pack can now stay cool. And if you need to carry a hot lunch, simply don’t put the bags in the freezer. They work great and keep everything insulated. 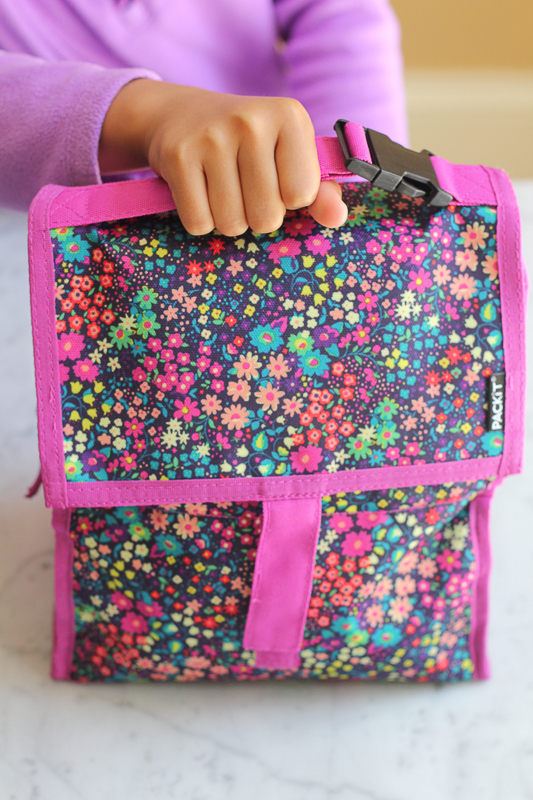 We love that the handle has a clip so my daughter can clip it to her backpack after lunch. She says this is key! The bag also has a zipper close which I love! PackIt is the smartest, simplest way to keep food and drinks cool anywhere. It works just like a refrigerator on the go, continually chilling your food and drinks for up to 10 hours! The secret is the cooler’s freezable gel liner. Simply store the folded PackIt bag in the freezer overnight. Once the bag is frozen, its walls generate waves of cold air that chill your food and drinks from all sides. No ice packs needed! “PackIt’s patented built-in technology keeps items cool all day without ever needing ice packs. It’s so powerful that it can even drop the temperature of liquids 25 degrees within the first hour. That’s right—it actually makes room-temperature items cold! 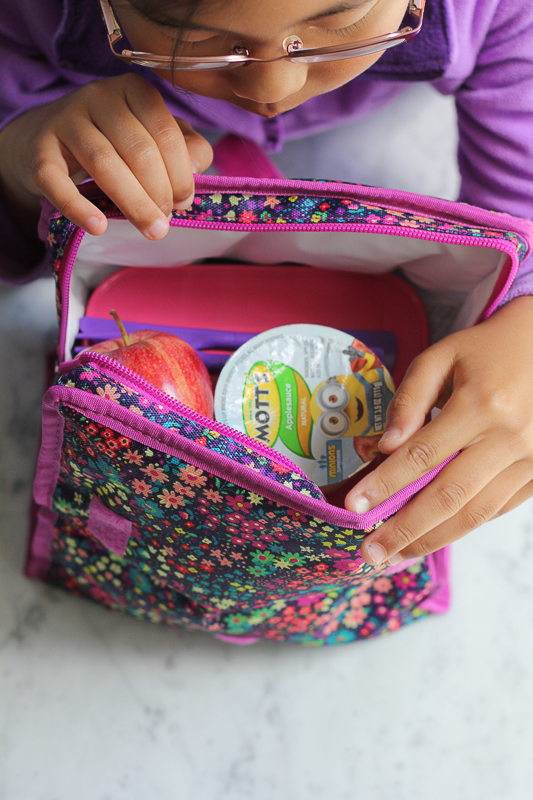 Best of all, it folds up for compact storage in your freezer and is ready to go when you are.” You can find PackIt freezable lunch bags at available at major retailers such as Target, Bed Bath & Beyond and Amazon, as well as at PackIt.com. So, new school year. . we are ready for you!!! 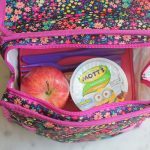 My kids can’t wait to use their new freezable lunch bags! Wishing everyone a great school year! 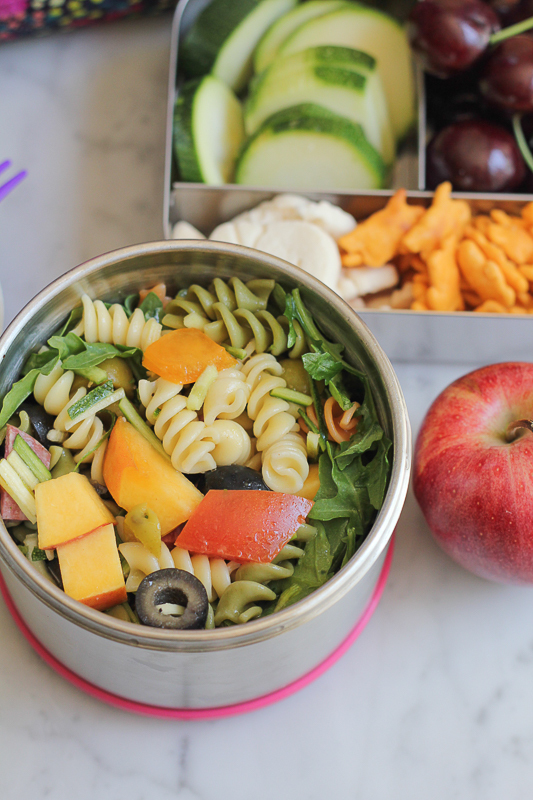 and don’t miss my daughter’s favorite pasta salad down below! 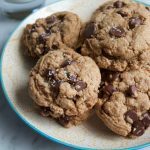 Moms and dads, you might want to make this for yourself too! Ready to BUY a PackIt freezable bag today? 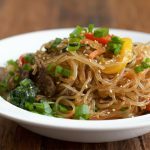 Use this Unique Promo Code: HIPFOODIEMOM15 and enjoy 15% off your order! This will expire on Tuesday, August 11th. 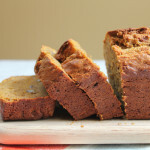 *If peaches are not in season, you can use strawberries or apples for some texture and fun. 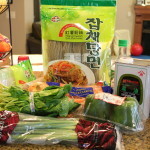 Cook pasta according to package instructions and cook to al dente. Drain, lightly rinse and allow to cool. Using a large mixing bowl, pour in the pasta. 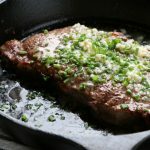 Drizzle with the olive oil and gently mix together. Next, add in all of the ingredients from the zucchini to the arugula. Gently toss together. Drizzle on your favorite Italian salad dressing and mix again. Enjoy! 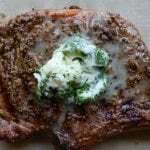 If packing this for a lunch, pack the dressing separately and drizzle on right before eating. 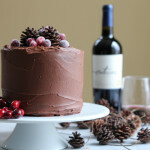 One lucky reader will win $100 to spend at PackIt.com! And this isn’t just for the kiddos! PackIt has great freezable bags for everyone! Need to pack food for a road trip or a trip to the beach and want to keep your food cold or cool? PackIt can do that!! Enter the giveaway below and good luck! Giveaway open to residents within the United States only. Disclosure: This is a paid, sponsored post in partnership with PackIt. All opinions expressed here are 100% my own. Thank you for supporting me in working with the brands and products that I use and love. I want the ziggy pattern carryall lunch cooler. 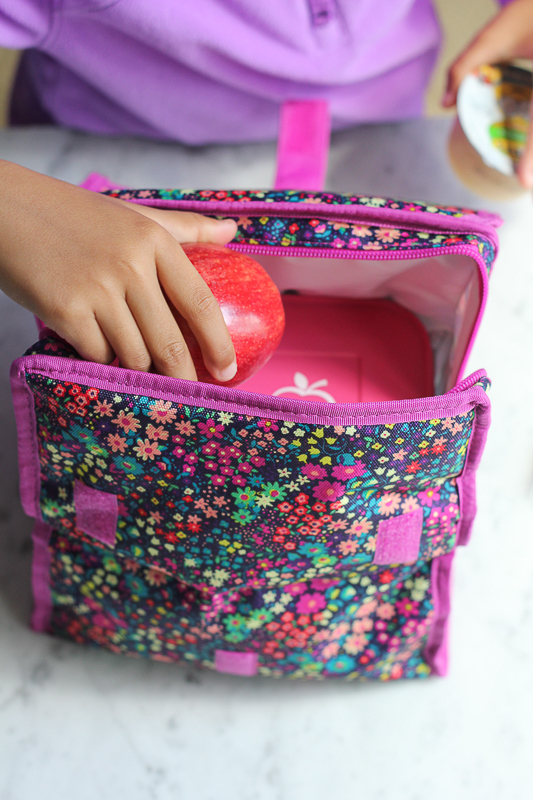 These Packit freezable lunchbags look amazing! I’m like your kids, I like my drinks cold! My kids only go back the 2nd week of September..we still have at least 5 weeks of school holiday. To be honest it will be kinda sad not to have them around all the time..
My son would love the camo lunch bag! I can’t believe that summer is nearly over. Where has it gone? These bags are really cute though – I wish I had of had something like that when I was in school. That’s actually a really good idea, to have freezable bags. My daughter’s Hello Kitty lunchbox just went AWOL at camp, so we need to get a new one anyway! So, as a teacher, I am trying to brace myself here for a new year. I actually love starting up again, but I will miss the lazier pace. It’s not fun rushing around all the time. Otherwise, new kids to meet, new learning to do! My son would love the monster print. Wow…you can freeze the whole bag? Awesome!! We have a little one on the way, so that baby bottle bag would be on the top of our list. Right next to one of the awesome picnic bags! Thanks for sharing!! The Saturday carry-all bag is pretty cool! I’d love the original lunch bag in ziggy! Either of the pink bags would work for us! What a great idea…. These lunch bags sound awesome and I’m smitten with how cute they look 🙂 We are starting back to school shopping too and in a way I’m kind of happy and freaked out at the same time since it’s my son’s first year. He loves his drinks cold too so I can’t wait to check out the lunch bags from PackIt! 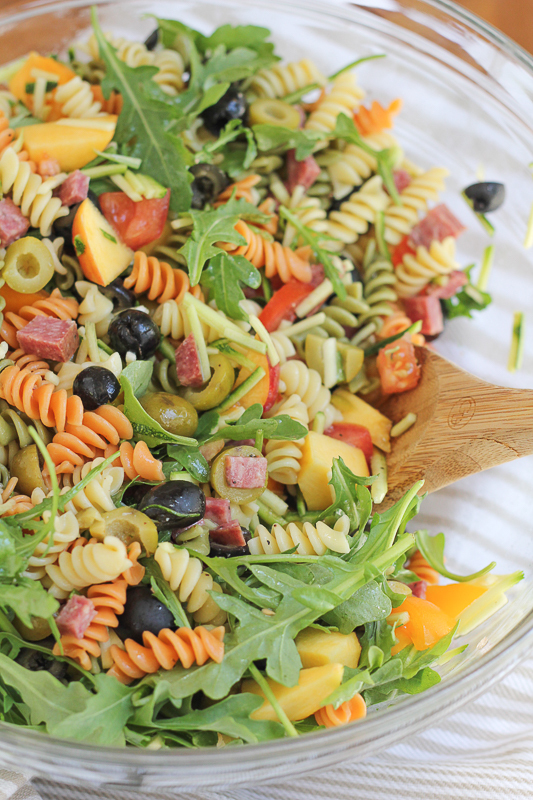 Love your pasta salad, it looks amazing! This is a brilliant idea. My daughter would love the lunch bag in the ziggy print! So adorable and clever… can grown ups use them too?! I adore this fruity pasta salad, what a great way to use up the fresh fruit and veg from the season! 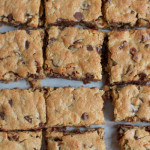 I don’t have any kids to send to school, but these would still be great for the husbands lunch! I love that they’re freezable too! Thanks for the awesome giveaway! 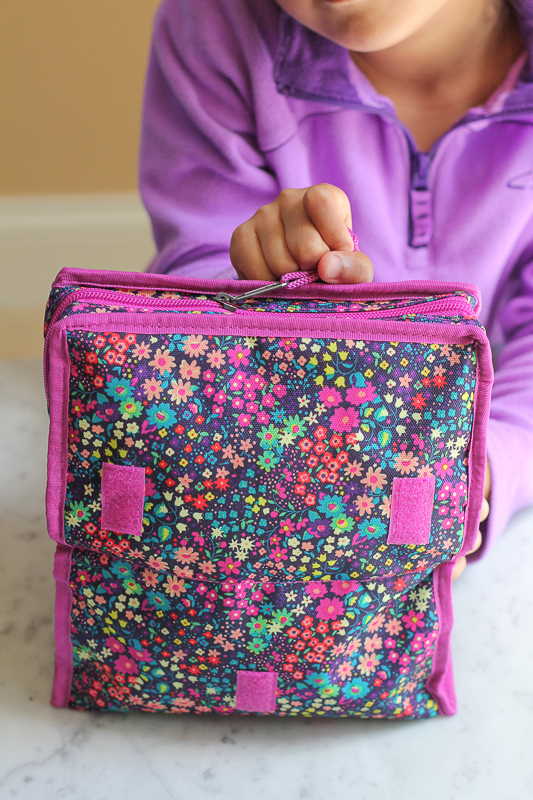 Alice – I need to head to Target and look for this – my daughter needs a lunch bag this year and one that will chill her foods to 25 degrees and keep it chilled for 10 hours sounds perfect for her – especially in that mini size! I would like the black Insulated shoulder bag and the Chevron Freezable Lunch Bag. I saw these bags on the news this week, and the woman who created them, love the idea and also the designs are so cute. 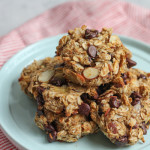 I’ve wanted to try these for my children’s lunches! The gingham pattern looks cute! I’ve always wanted to try these! the gingham pattern looks cute! My child walks on four legs and has fur… but she told me she wants to keep her frozen puppy ice cream treats in this super stylish bag! 😉 For real, this puts brown paper bags to shame! Why didn’t they make super cool AND freeze-able lunch boxes when I was young? Womp womp! Anyways- pasta salad is always yummy and your family FAV sounds delish! 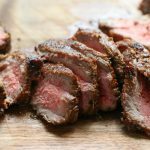 Love the ingredients you used! Great post as always, girlfriend! Pinned! Cheers! 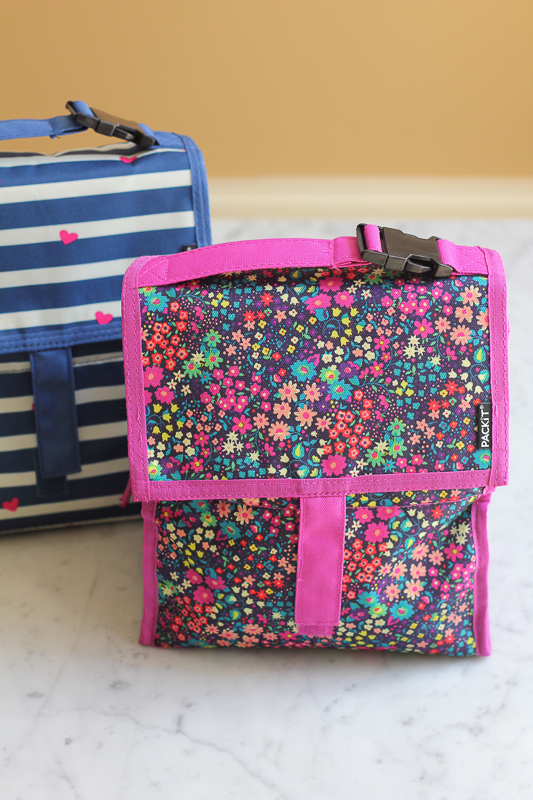 These seem great, love the carryall lunch pack in the chevron pattern! Yikes, back to school already?! Time is flying! These packs are absolutely adorable (love the print) and so handy! The freezable callyall lunch bag is awesome. Love the black and white gingham picnic bag! We love packit! 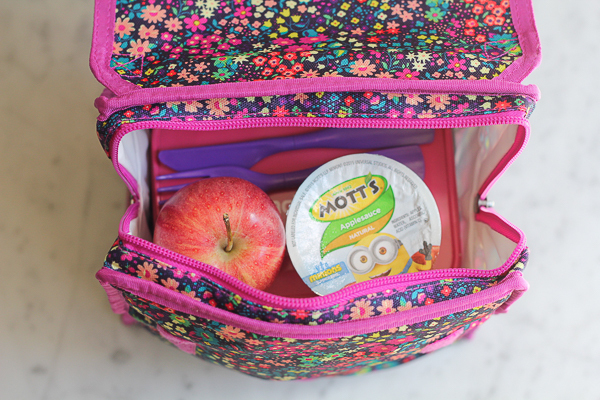 They’re the perfect pack along for field trips. I think we have every color. 🙂 Yeah we’re addicted they’re so convenient and durable. Thanks for sharing Alice! I like the lunch bag and the grocery bag. What a great idea!! wow these packit bags sound wonderful! love the pasta salad! I Love The Design On The Carryall Bag, Saturday Bag. I’d really like to get the Freezable Picnic Bag with the black and white checkered pattern! I totally loved back to school shopping so I’m just like your girls. These are so stylish. I wish they had these when I was growing up. I’m 24 and I want to bring my lunch in that bag! 🙂 So flippin cute. I love the Freezable Uptown Lunch Bag! I’d love a custom bag….or the Geometric Freezable Lunch Bag. Love the camp lunch bag! My girls would love the Bloom or Saturday lunch bags for school this year!! So awesome! I need the cammo one for sure! I wish I had those stylish bags to use for lunch when I was in school!! I use insulated bags to carry my lunch to work all the time. I wish I can have one of the carryall bags! 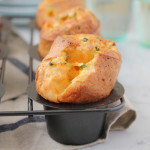 They look perfect for larger tupperware! What a great gadget! I’ve been using ice packs in my kids’ lunches, but this sounds way better. And the prints are so cute! We’re empty nesters over here and I miss those elementary school back to school things sometimes. I’ve seen these cool freezable lunch boxes and thought about getting one for myself! Do they make a princess or Hello Kitty? I would totally rock that! I’d love the Uptown Lunch Bag in Bloom! 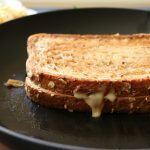 I’d take my allergy-friendly lunch to my nanny job! I love these! My fpies kids (yep I have2!) could use these. We have to pack all of our food when we go out bc they’re sensitive to soy! what a cute and fun treat for school! I love the wine bags and the grocery bags! 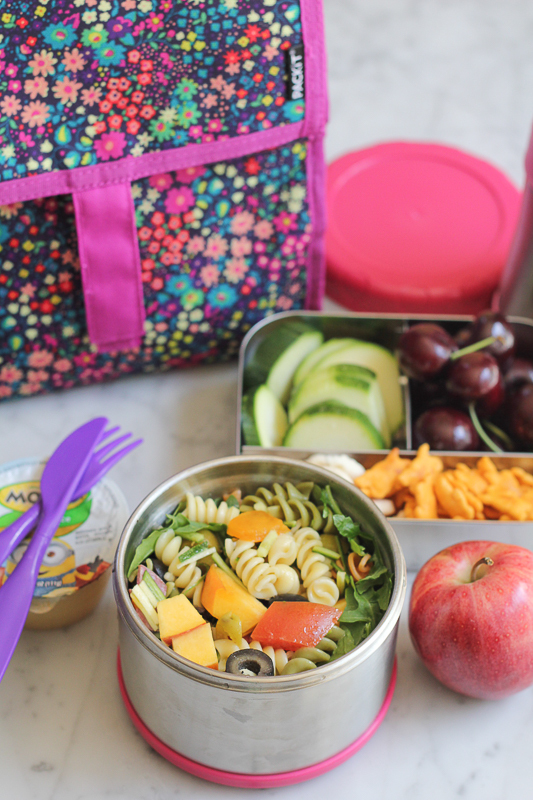 The lunch bag is so CUTE and colorful.. and the paste salad looks healthy and delicious! I’d love the carry all bag but all the designs on the lunch bag are way better so I’d probably pick that one – the blue striped one with hearts is adorbs! I like their grocery bags and the carry all bag. I like the Carryall Bag in Gingham! These bags are adorable!! I kind of want one to take my own lunch every day. Oh, that is a brilliant idea, and would be so much more convenient not having to have ice packs! And it would be perfect for my college classes that I need a snack or meal in because I don’t have breaks for the day! Bloom lunch bag and grocery bags, I want them all!! I’d start with the freezable grocery bags, since we always have a need for those, but the lunch ones are so cute too! Oh my goodness, these are brilliant! LOVE that they are freezeable and that buckle is so awesome! I would like to get a couple of the freezeable lunch bags for my husband and me. He would like to Camo one, I think! I love the Carryall in Micro Dots. The picnic bag would also be handy! I love the gingham one. It’s very cute and would be great for work lunches. I love the freezable picnic bag! I’d get the Deluxe Lunchbag with the chevron pattern, a Sandwich bag, and a Picnic Bag. ok, i gotta go to BB&Beyond to get these pack its! such a clever idea! thanks for sharing! Love the Saturday lunch bag! I like the Gingham Freezable Carry – All. I would love to get the Surf Stripe Lunch bag and the Ziggy sandwich bag.